Mosaica Education’s Paragon™ Curriculum combines the rigor of classical education with the relevance required by contemporary society. Students learn about character, ethics, empathy and self-esteem by studying the world’s great heroes and by stepping into the shoes of great historical figures. Paragon’s school-wide chronological journey through the history of great ideas and people in world culture is immersive, hands-on and fun. It is the kind of deep learning that lasts for a lifetime. Paragon™ looks to the past to prepare students to become the architects of tomorrow. With an immersive hands-on approach, Paragon™ addresses students’ multiple intelligences and individual learning styles. Through this engaging curriculum, students gain historical information, and come to understand the expansive potential open to them if they can identify with early clarity their individual strengths and sense of purpose. Rather than teach history in bits and pieces in arbitrary sequence, Paragon’s fully integrated, chronological approach demonstrates to students how one idea builds on and evolves into another. The curriculum illustrates how sweeping cycles repeat and leads students to understand the evolutions of world cultures. In Paragon™, students study history across continents, and gain a profound understanding of the manner in which many ideas develop at the same time in independent cultures unaware of the other’s breakthroughs. Through this, students develop a larger picture of history and the associated interrelationships. Rather than memorize names, dates, and events in isolation, students recall the sequential circumstances surrounding these events and remember more readily both factual information and conceptual relevance. Students learn connected networks of knowledge, skills, beliefs, and attitudes that they will find useful both in and outside of school. The significance and meaningfulness of the content is emphasized both in how it is presented to students, how it is developed through activities, and how it is authentically assessed. Step-by-step daily lesson plans are organized around essential questions- questions that have captivated thinkers for millennia and that will continue to fascinate students, thereby connecting them with the content more profoundly, more personally, and more purposefully. How does Paragon™ propel student achievement? What are the effective teaching and learning strategies propelled by Paragon™? 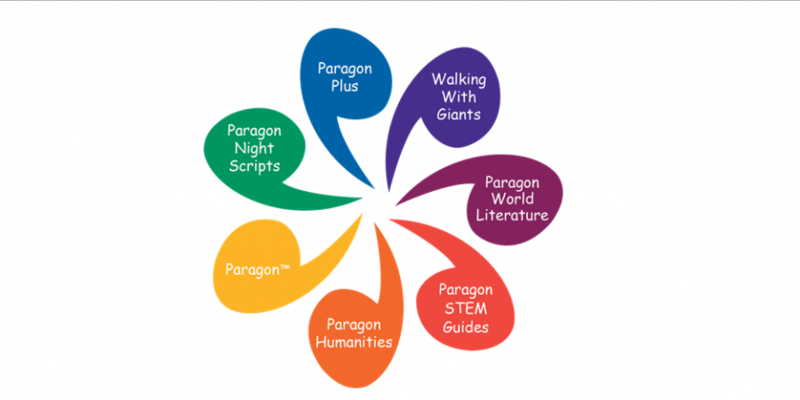 Paragon™ addresses the part of the curriculum neglected by traditional education publishers. By integrating the humanities and social sciences with an experiential re-creation of daily life throughout world culture, Paragon™ awakens the genius in children and reignites that of their teachers and parents.